Two very different interior design projects, offices for a Dublin-based firm operating in the world of air travel by Powerhouse Company and a meeting room for the Austrian Banks and Bankers’ Association in the Vienna Stock Exchange designed by AllesWirdGut, demonstrate how developing an idea can become the key to a project on any scale, from urban planning to product design. The architects of Powerhouse Company worked on a modern building constructed in the middle of the last century in the centre of Dublin, near St. Stephen Green, completely reorganising the interiors and transforming them into the offices of a firm operating in the world of air travel. 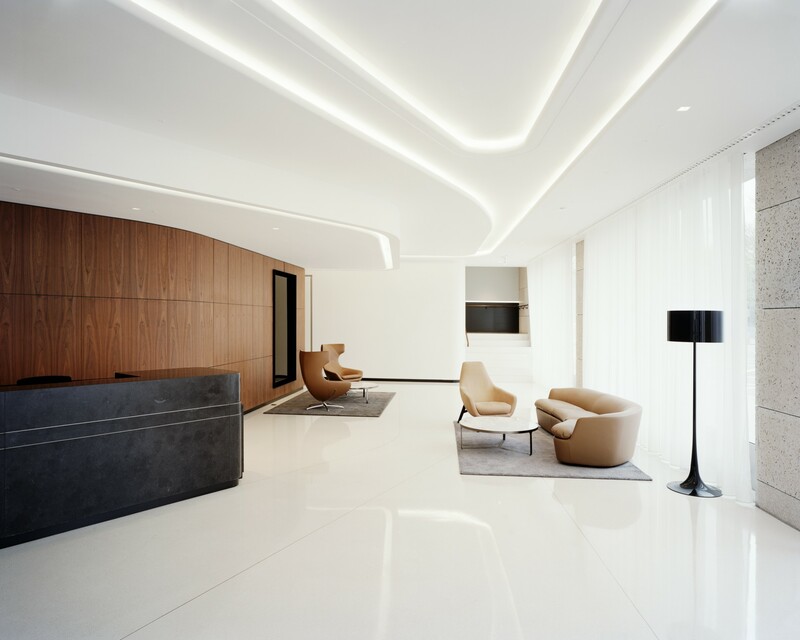 The architectural solutions and elements, and the materials used by the architects, were inspired by aerodynamic curves to pay homage to the client’s field of business. The total project area measures 6500 sqm, on a number of levels; the new office building includes a welcoming entrance hall, a restaurant, a congress hall, a fitness area, four floors of offices and the management offices on the top floor. The architects designed a number of connecting spaces to create links between the functions present in the building. The spaces encourage various degrees of formal and informal interaction among different types of user: colleagues, consultants and clients. The colours and materials adopted in the project not only create a subdued atmosphere of elegance and luxury, but above all set a high standard in terms of sustainability, for the project has obtained LEED Gold certification. Numerous details of this elegant, cosy environment recall air travel, from the lighting to the materials used. Starting in the ground floor reception hall, a sculptural elliptical staircase of wengé wood rises up to all the building’s five floors. The staircase adds motion to the construction and encourages users to interact and move about in the building to reach different levels. On the upper levels, little differences in the flooring or the office layout make it easy for people to find their way around the building. The fifth and top floor is slightly smaller than the others, and contains executive offices with panoramic views of nearby St. Stephen Green, a public park. AllesWirdGut worked on an interior design project in the Vienna Stock Exchange building, constructed between 1847 and 1877 and then reconstructed in 1960 in the wake of a terrible fire. The architects applied an approach to interior design in line with the studio’s modus operandi. AllesWirdGut interior designer Andreas Schmid clarified that the project was a matter of solving the problem of building in an existing building, no matter what the scale of the project. In this kind of project, "it is never a matter of taste, but of telling a story and creating an atmosphere” (Andreas Schmid). The architects therefore translated the spaces designed in the '60s into a contemporary design. Their homage to the ’60s is underlined by use of items of furniture by famous designers of the age, such as Motoko Ishii and Hans J. Wegener. The architects do not settle for vintage revival, but create an atmosphere of elegant simplicity evoking a classic atmosphere.